Ghostbusters. I would love to write an impassioned defense of the new Ghostbusters. I would find it deeply satisfying, both as a fan of the original and as a person who, hating few things in this world, passionately hates misogynistic Internet trolls. But there are mitigating factors, first and foremost: the movie itself. The problem with this particular reboot has nothing to do with its casting. More to the point, it could only possibly be helped by the fact it stars four devastatingly funny women, all with formidable talent for commanding the screen. And while the prospect of a reboot is an inherently dicey one — especially when the source material is so well known by so many — that isn't really the problem, either (it does bring up a few issues, but more on that in a minute). Obviously, I can really speak only for myself, but I believe audiences for the most part are with me in the willingness to go into this one with an open mind. Maybe with a positive bias, even, based on the strength of the cast or the reunion of director Paul Feig and screenwriter Katie Dippold (The Heat, 2013). So the problem with Ghostbusters isn't its bonafides; it just isn't funny enough. Rather, it isn't funny often enough. The tone and pace of the piece start to sway drunkenly from arch-goofiness to glum solemnity in the opening, which can't even be saved by the consistently hilarious Zach Woods. The rest, despite flashes of high comedy, follows suit. After the introduction of the ghosts, we move on to our leads. Erin Gilbert (Kristen Wiig), a physicist vying for tenure at Columbia University, fears for her future in academia when a book she co-authored with Abby Yates (Melissa McCarthy), positing the existence of ghosts, re-surfaces online. 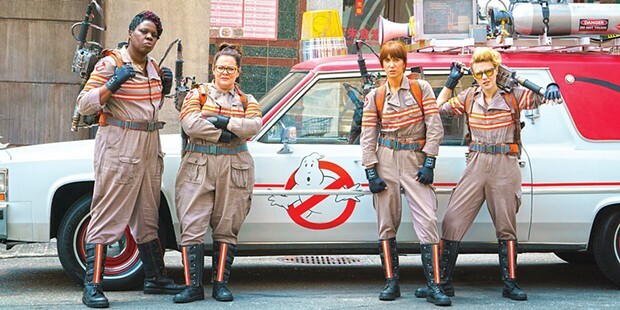 She tracks Abby to her laboratory at a cut-rate college, where she and engineering savant/genuine weirdo Jillian Holtzmann (Kate McKinnon) have been developing ghost hunting tools and methodology with minimal oversight from the administration. The powers that be (represented in a great cameo by Steve Higgins), catch on quickly though, and Abby and Holtzmann are soon out of a job. And after some dramatic supernatural documentation video goes viral, so is Erin. The three hang up a shingle as paranormal investigators, hire an impossibly incapable/good-looking receptionist (Chris Hemsworth), passively recruit Patty (Leslie Jones) and get down to the business of bustin' ghosts. They soon get hip to an interlinked series of occurrences enacted by a pasty little villain (Neil Casey), hoping to foment cataclysm; the ladies have their work cut out for them. Ghostbusters, circa 1984, still looms large on my movie landscape. Yes, it is now plowing into its mid-30s, much as it pains me to admit it, but thanks to our multitudinous "content delivery systems" and "media platforms" and "streaming services" and "devices," it is now more available than ever before. So even if the primary audience for the 2016 version isn't as well-versed in the lore as, well, me for instance, it likely has at least a passing familiarity with it. And the secondary (read: older) audience must be so steeped in it as to make refraining from comparing the two all but impossible. So the only hope, one might think, would be to make the new one really new, somehow remarkable, revolutionary rather than evolutionary. While Feig makes savvy use of current CGI technology to achieve an undeniably modern look to the effects, he isn't breaking any molds stylistically. Not that we should expect that: he's always been a bit of a formalist, and that's perfectly respectable. So the big coup here, ostensibly, is in the casting, which I find troublesome. Troublesome because it is the year 2016 and casting women in lead roles in an action movie or a comedy or whatever it may be should not be surprising. But there it is. Perhaps more to the point, Feig and Dippold's version of this story is so over-burdened by effects sequences that it often forgets to be a comedy. Long stretches go under-punctuated by jokes, and some of those only amount to half-funny pratfalls. There are strong laughs along the way, but inconsistently and sparsely placed. The four leads are great, as one would expect, with McKinnon in particular doing hilarious, bizarre, surprising and under-utilized work. PG13. 117M. BROADWAY, MILL CREEK. The Infiltrator. As with his last effort (Runner Runner, 2013) director Brad Furman takes a formidable cast, a fascinating story, an unexpectedly distinctive visual style and assembles a movie that doesn't quite live up to any of its attributes. While good enough, it shows potential for a greatness it never achieves. Tampa, 1985: U.S. Customs agent and family man Bob Mazur (Bryan Cranston) develops a revelatory attack on the Medellin Cartel. Using contacts nurtured by fellow undercover agent Emir Abreu (John Leguizamo), he poses as a mobbed-up finance guy offering to launder cocaine cash. After some scary auditions, he's in and becomes the right hand and personal friend of Escobar lieutenant Roberto Alcaino (Benjamin Bratt). These "in too deep" undercover stories are pretty familiar by now, (see: In Too Deep, 1999) and, despite its strengths, The Infiltrator doesn't get far enough below the surface to distinguish itself. There are glimmers: Mazur's relationship to his fake-fiance and fellow agent Kathy Ertz (Diane Kruger) hints at the intimacy of two people sharing an unspeakably intense secret; violence erupts in unexpected instants; Mazur's family life is strained by his commitment to the job. None of these notions are fully enough explored to elevate The Infiltrator beyond popcorn level, though. R. 127M. BROADWAY. For showtimes, see the Journal's listings at www.northcoastjournal.com or call: Broadway Cinema 443-3456; Fortuna Theatre 725-2121; Mill Creek Cinema 839-3456; Richards' Goat Miniplex 630-5000. ICE AGE: COLLISION COURSE: Scrat's acorn quest goes terribly wrong, threatening the entire Ice Age World. Ray Romano, Denis Leary, John Leguizamo, Chris Wedge and the rest of the herd are back to keep things Icy. PG. 100M. MILL CREEK, BROADWAY, FORTUNA. STAR TREK BEYOND: A lizard-like dictator (Idris Elba) forces the Enterprise — along with Kirk (Chris Pine) and Spock (Zachary Quinto) — to crash land on a mysterious world to do battle with a deadly alien race. Better set those phasers to stun. PG13. 122M. MILL CREEK, BROADWAY, FORTUNA. LIGHTS OUT: A supernatural entity returns with a vengeance to torment an entire family in this horror thriller, with Teresa Palmer and Gabriel Bateman. PG13. 81M. MILL CREEK, BROADWAY. THE BFG. Steven Spielberg's animated adaptation of the Roald Dahl children's story brims with wonder and possibility. While it droops toward the end, the magical premise and escapist joy of the first act endures. PG. 120m. BROADWAY, MILL CREEK. FINDING DORY. Ellen DeGeneres voices the friendly fish with the fried short-term memory (anybody relate?) who's searching for the rest of her long lost blue tang clan. With Albert Brooks and Ed O'Neill. PG. 97m. BROADWAY, MILL CREEK. LEGEND OF TARZAN. After his Victorian makeover, Tarzan (Alexander Skarsgård) reverts to his chest-pounding ways to rescue his bride from a Belgian baddie. PG13. 87m. BROADWAY, FORTUNA, MILL CREEK. MIKE AND DAVE NEED WEDDING DATES: A laugh-out-loud comedy about two fun-loving brothers (Adam Devine and Zac Efron) looking for respectable dates for a family wedding. R. 98M. MILL CREEK. THE SECRET LIFE OF PETS: A family-friendly tale of rival dogs in New York City that doesn't really live up to its powerhouse cast, which includes Louis C.K., Jenny Slate, Kevin Hart, Albert Brooks and Dana Carvey. PG 98M. MILL CREEK.